With my rib on it’s way to healing, you can imagine my joy when lower back pain from my motorcycle accident took over! Thankfully, the reclined race seat position actually made it the most comfortable I’ve been since the accident, rather than putting me in pain again. Having fixed all the gear selection issues after Mondello, and having straightened the trailing arm, I went out to qualify with the car feeling good, just stiffening the dampers slightly on the dry track. I built speed steadily and was feeling very relaxed and in control – the Sheane was taking everything in it’s stride and I was giving a slight lift into Abbey and building up to taking it flat. Coming down the Hangar Straight, the engine note changed and all the power disappeared just before I lifted off to get o the brakes. I switched off instantly, cursing as I let the car coast all the way back around and into the pit garages. 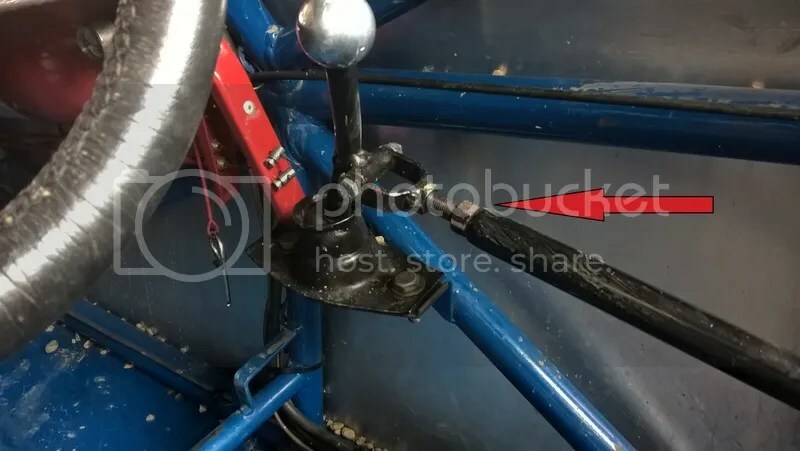 With just two hours to go before the race, Glenn Hay did his thing to replace the piston and barrel, hoping that would at least get us back out there. Unfortunately we ran out of time, but were confident that we’d be on the grid for the second race the next morning. The curse of Silverstone strikes yet again! By way of consolation, I learnt I’d been running 14th for most of the session, and only dropped to 18th in the final laps, so I knew I was up to speed with the rest of the grid. Staring at my empty grid spot from the top of The Wing, at least I knew I could look forward to watching some great racing. Sam Engineer was the stand-out driver, as he was right on the pace and challenging Andrew Cooper! I figured if he could do it, I could get into that little scrap myself, and with James Harridge not racing that could still mean a class B win if I could take Cooper! Overnight rain had left the track greasy. Just after I arrived at the circuit, marshals started shouting for us to get ready, as they wanted to send us out an hour early. I pointed out that a few drivers hadn’t actually arrived yet, and the decision seemed to change to wait until after the church break. I’m too nice, sometimes! There was a dry line on the warm-up lap, and I made sure to work my tyres hard. Rooting for rain, I’d softened the front anti-roll bar. It should have been taking a gamble if it stayed dry – as it turned out it did stay dry, but the car coped just as well with my compromised settings. When the red lights came on I was completely focused on them. My whole world was just waiting for those lights to go out. They did, and I passed six cars into the first turn with probably my best start ever! John Hughes and Alex Jones snuck past, and Sam Engineer spun ahead, separating the pack as we took avoiding action. I was right on Coopers tail, exactly where I wanted to be, and poised to go for that class win. I could tell I was a little down on power (we hadn’t done anything about the other cylinders), but I was driving well enough to keep me in touch in the twisty bits, so thought I could still make a move. As I skittered through The Link onto Hangar Straight for the second time I knew I was in trouble. As I changed up to 4th gear Cooper shot away, and Jamie Harrison simply drove past me. I saw a cloud of oil smoke in my mirrors as changed back to 3rd, but it hadn’t been the same power loss as in qualifying, so I decided to stay out and see if anything got worse. I didn’t seem to be losing much oil, but Mark Egan had also gone through as I concentrated on whether my engine was about to grenade itself or not. I locked up the front tyres into the complex as I tried to claw them back in, and was right on Egan’s exhaust until we got back on the power, when he just started edging away and then I caught him up again carrying more speed through Abbey and hanging onto the back of him, Jamie and Cooper as we hit Hanger straight for the third time. That was then the engine really went off a cliff, and I lost at least 2 seconds on them and Ed Lowndes caught, passed and gapped me, and Colin Gregory who wasn’t even in my mirrors tried to dive up the inside! I held firm around the outside, sort of good to have last years sparring partner back wheel to wheel, but he still got ahead by half a length before we had to brake for the complex. I stayed with them again until Hangar, and then had to admit it was futile. My mirrors were clear (although I knew that wouldn’t last) so I decided to short-shift up to try and save the engine, and limp it through to the finish to pick up whatever points I could. Maybe my speed through the corners could keep me ahead? I knew I should be at least 2 secs a lap quicker if I could improve Stowe, so could have fun trying! That didn’t happen, and my prayers for a red flag somewhere went unanswered as well, with a horde of white cars growing ever closer in my mirrors, led by Vaughn Jones. I noticed the smoke increasing as well, now every time I got back on the throttle, and by the last lap I was leaving a trail of smoke all the way around – I still had full oil pressure and hadn’t seen any flags for me, so figured it was just cooking off on the engine. I crossed the line just holding 18th place overall, and 4th in class, and I don’t think the car had another lap left in it! I switched off well before the end of the lap and coasted into the pit lane. So a bit of a disaster, but I guess I saved what I could. It’s a shame I couldn’t show what I could do, as I felt I was driving the best I ever have, and the car was handling great. As I write this we’ve been through all the emotions, from ending our season to mad scientist style planning to keep things going. We found the same piston had picked up again, and huge chunks of piston had crumbled away, and at least one more piston and barrel were scrap – but really all of them are done for. A section had also snapped off another piston ring. After a very long discussion, we decided that if we just put new pistons and barrels on the same could happen again, and in addition we knew bits could well be clattering around inside the engine. Is it worth risking another set for something that could just happen again in qualifying? No. So the only real option was for us to get the engine out, strip and clean everything, and then hope we have time to get it all done and back in for Donington Park on 2nd September. But then that means if we use new parts we have no chance at all of testing to run them in, and again risk expensive failure. That meant hunting around to try and scavenge some pistons, and now we’re just in the parts bath and rebuilding race. Then there are problems with the VW Camper, an injector leak on the Freelander, and whatever else the world is throwing at us this week to stop us getting the car on track! It’ll go right down to the wire, but Glenn says we can do it, so we’ll be there! My usual start took me forward a few rows and the car felt good, although still lacking power. I was still in ‘safety’ mode so not trying anything daft, and I’d got myself into a pack of about nine cars, so that took a bit of restraint. I’d taken to dropping to third gear for Paddock as the engine seemed to handle the revs ok, and I was still getting that flat spot in fourth. Neil Aldridge had an absolutely terrible lap and dropped right from the front of our pack and I had a great run on him into Paddock around the outside. As I’d committed, Vaughn Jones cut from the outside line to the inside to make a move on the cars ahead, and spun on the inside of the corner just ahead of Neil. I saw all of this and moved another cars width to the left so that I was right on the edge of the track and Neil had plenty of room to also move left as Vaughn’s spin took him across the track. Unfortunately Vaughn either clipped Neil or he had to dive left more to avoid him, and I was directly alongside and going past. Neil sideswiped me wheel to wheel, causing us both to spin with him now in the gravel. 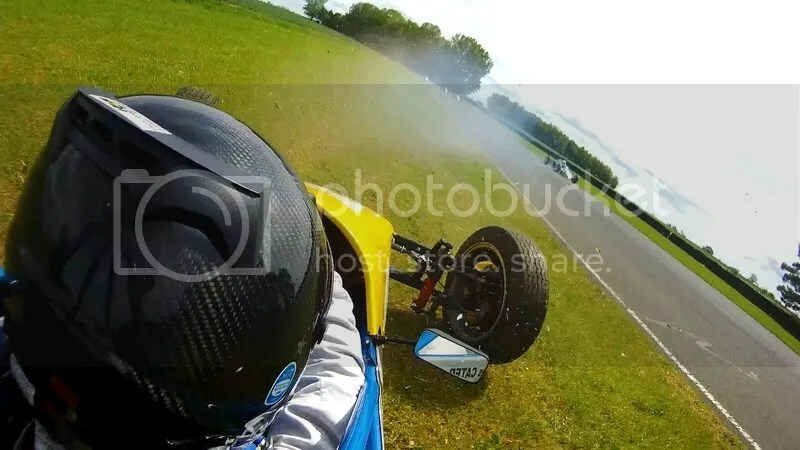 I could hear his throttle fully open as he slammed into me again, his airborne rear wheel ripping a hole through the aluminium side panel inches from my head, this hard impact sending me off at a tangent across the track to the infield. I was on the grass with the engine still running, looking very carefully at my right rear wheel where it felt like the main impact had been. I knew the front would be bent, so wasn’t paying much attention to it as I eased the car forwards, and it was heading in a straightish line. I cruised up to Druids and was starting to think I could crawl around and pick up points, until I dabbed the brakes and the car slewed left and over the gravel. I knew it was race over for me, and remembering how they’d red flagged qualifying when Bill Garner pulled off at that exact spot I was eager to get the car to a safe place where they wouldn’t stop the race. I pointed left towards the marshal post and a group of marshals there were signalling crossing their hands in front of them in the ‘no’ gesture, so I pointed to the right, to the infield of the hairpin to a dirt road that would take me behind the barrier. 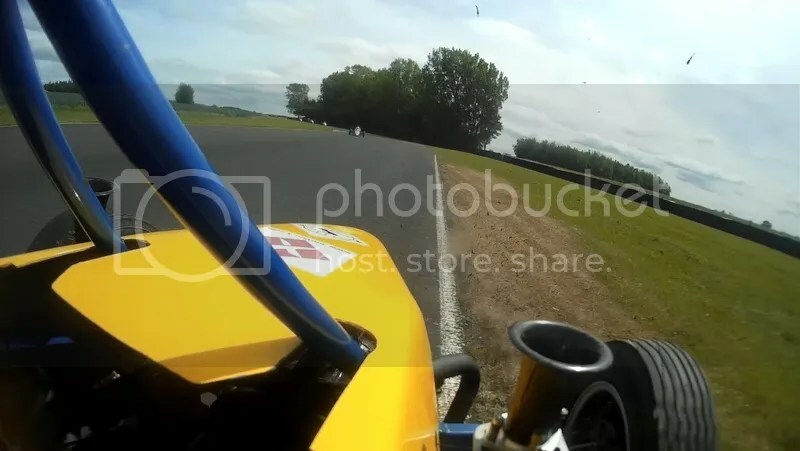 I should note that all this time I couldn’t see behind me, as the crest of the road meant all I could see was the top of Paddock Hill, 300+ metres away, so there was no way I could make out any cars. Everything else was hidden in the dip. Still pointing to the infield, I looked at the marshals who were pointing repeatedly to the spot I was looking to go. I gave a jab of throttle and crossed the track and into the refuge area – but as I ran up the curb on the infield I saw the pack stream past me in my mirrors. Close. VERY close. You can hear me, dripping with sarcastic rage, say “I don’t think they should have told me to do that!”, before getting out and stropping around a bit, moaning to the spectators about what had just happened. A red flag came out for Neil and the marshals came over to help me. So we’d simply miscommunicated – not surprising as there are no pre-arranged hand signals between us, and, as demonstrated here, it could all be misinterpreted. I shouldn’t have used the marshals as my eyes when I couldn’t see – they already do a hard enough job and I shouldn’t have assumed we were on the same wave length. It’s definitely not their fault, and do a brilliant job keeping us safe. I also realise that this incident will look Very Bad to everyone, and on the TV coverage, so wanted to at least get my side of things across! Another lesson learned, and luckily no harm done. I’ll do a separate damage report, but we do still hope to make Croft. Thanks for sticking with this very long write-up! Arriving in Anglesey on a sunny Friday afternoon, there weren’t many places I’d rather have been! After the long but beautiful drive through along the Welsh coast, and past the mountains of Snowdonia, we arrived early enough that Ben Miloudi kindly let me jump in for the last test session of the day – something I haven’t ever done since my first race! I was able to get straight on the pace, and the car felt good. The test session had given me my confidence back and I knew I could trust Glenn’s work as usual. I was able to push the car safely, losing the front a few times but without any drama on what was one of the most grippy tracks I’ve ever driven on! I qualified 20th and 17th – but this really didn’t do it justice, as the first 25 cars were covered by 5 seconds and first 20 within 4! All the fast guys were out and on it – including Graham Gant coming out of hiding for the first time this year to grab pole! In B class, the usual aliens – James Harridge and Jack Wilkinson – were way up the front, but the rest of us were all packed together with very close times. Tim Crighton had done excellent to head the best of the rest putting his Scarab a few rows ahead, but everything was set for an epic B class battle. With the sun still beating down on us (for once!! 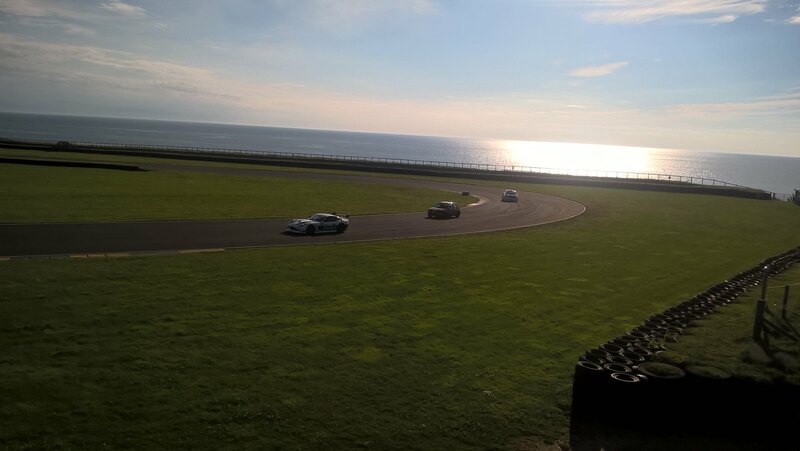 ), I took it a bit too safely on the start (not wanting a repeat of Croft!) 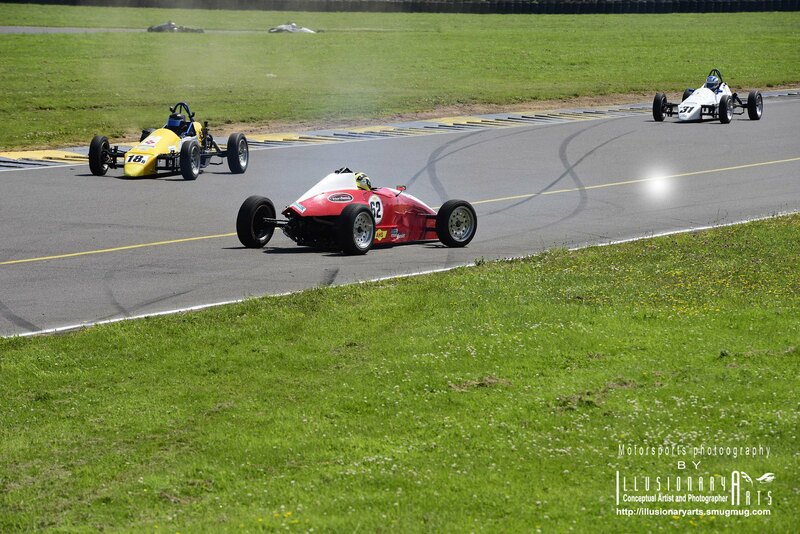 and let a few cars past me, tucking in behind Vaughn Jones, Martin Snarey and Dave Leniewski. With 2nd gear selecting perfectly this year, I drove out of the tight Rocket corner and took Vaughn on the inside of the next turn, hassling Snarey over the line before making a move on the exit of my favourite corner – Church – and holding him off down the back straight as I set my lights on Leniewski. I wasn’t making much progress on him for a few laps, and there was still a pack flashing left and right in my mirrors, until Leniewski went oil surfing through Turn 1 and spun. I squeezed past and Snarey just stayed clear as well, but it gave me enough clear track to pull a gap. Unfortunately I found the same oil on the very next lap, getting very sideways but holding it. I did smile as I came out of the banked hairpin and looked across to see Leniewski do exactly the same thing again! The ol flags finally came out after that, so we were all a bit more tentative through there for the rest of therace, but at least there was no damage done! Meanwhile, I’d seen James Harridge pulled off the track with more engine problems, Tim Crighton and Jack Wilkinson were well ahead somewhere, and then I felt a pang of excitement as I realised the car I was catching was Colin Gregory, who must be 3rd in B class. I caught him quickly, selling him a dummy around the outside at Church before cutting back inside and using his tow to blast past down the back straight. Snarey soon joined the party, with the dark shape of Ross Price looming in the background. Gregory dived up the inside of me on the brakes into the banked hairpin on the last lap, and I again cut back, this time taking the inside as we were both flat into Church. With wheels inches apart, I again tucked into his slipstream and got that extra boost to pass down the back straight, this time driving defensively whilst watching Snarey trying everything he could to get past Gregory. I punched the air as I crossed the line, picking up the final B Class podium trophy – but above all bringing the car home alive and untouched after a great scrap and pushing as hard as I ever have! I’d finally got the car so on edge that one end or the other was moving in almost every corner, so I knew I was driving well. Again, the overall result of 14th doesn’t really do me justice, as I was less than 3 seconds per lap off the winners (Pete Belsey) time, so well up there! And other than gripping the wheel through the first corner harder than the Incredible Hulk, I was pretty relaxed about it all! A new day, and the sun was shining once more. I was starting from a decent position but wouldn’t really find out what the car would do until I hit the first corner at race speed – not great when the brief was yet again to try and keep the car safe. On the warm-up lap I gave the car a bit of a slide into the second turn and could tell straight away that things weren’t right. Added to this, the steering wheel wasn’t pointing straight, so my thumbs and stuff were in the wrong places. As I sat on the grid psyching myself up, I looked down to find my magical rev sweet spot to get another demon start. What I found was the turned wheel was hiding my rev counter! I looked back up and the start lights had already gone out and I’d missed it! I recovered fairly well, but with the random handling I stayed well wide through the first few corners so I didn’t end up hitting anyone else as I worked out what the car was doing. The car didn’t want to turn in at all, and then the understeer snapped from no grip overall to oversteer and back to understeer seemingly at random through the corners. I was dropping backwards down the grid and couldn’t seem to do anything about it! Sam Engineer spun off causing a red flag – then we were held for ages before being put back in some weird grid order where I dropped back even further. Then Tim Probert caught fire a little bit, and we had to trundle around on a third slow green flag lap. In between wondering if I’d catch fire, whether the engine would blow up in the heat, and if I could get the car to restart for the 37th time they moved us 20 yards forward, I told myself that the handling was all in my head, and I needed to give myself a slap. I got a much better restart, and was all over the back of Colin Gregory for second in class (Jamie had already blown by me in the first start as I struggled) as I threw the car at the track as best as I could – not happy but not giving up! I couldn’t take any of the usual corners flat out, and needed a big lift to get the front turned in through Barcroft, still missing the apex by a few feet. Straightening the steering wheel with the repairs meant I was actually steering slightly to the left. This put my left rear wheel just onto the grass as I slammed the anchors on, and the back wheels made my best overtake of the day on my front wheels. 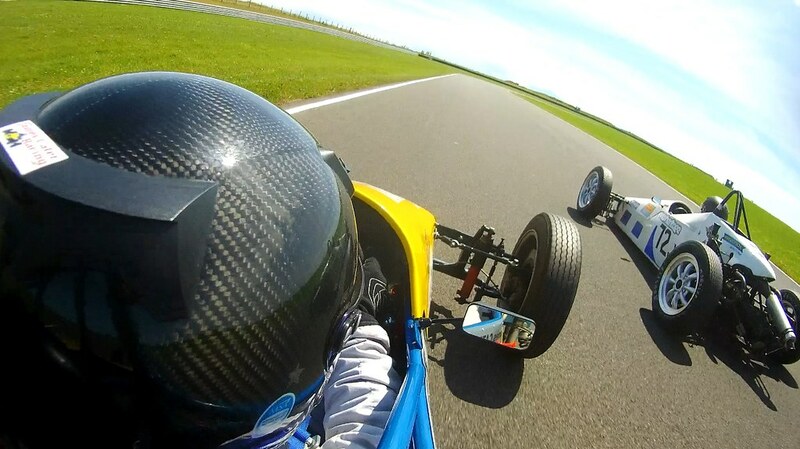 I was suddenly on the grass, backwards, on the right hand side of the circuit and the air pressure even opened my visor and I did what I could to stop taking Colin out as he turned right into Sunny In. I changed the angle of my spin enough to miss him, but there was no way I could stop the car coming back across the track. Luckily we’d been pulling away, and Bill Garner was next on the scene with some nifty avoidance as he locked up and managed to avoid me as I rolled along the outside of the track trying to restart. Crisis averted, I was now dead last and trying not to succumb to the red mist. I locked up into the hairpin then got back in control and dropped back into the zone as I gave chase to Ian Rea. I slipstreamed past Ian out of the chicane and chased down Martin Snarey and the 6 car chain ahead. It was taking an agonisingly long time in my head to make any progress, but I clawed past Martin on the start straight, and as I closed on Peter Cann saw Vaughn Jones spin up ahead. Before he had chance to recover back to speed I squeezed around him almost on the grass and then the short 3 lap restart was given the chequered flag. I salvaged a 17th place finish, but had been expecting top 10 at a track I love and the car is suited to, so it was hard to get too worked up about. It was an exciting race overall, but still a total disaster for me in the big scheme of things. Hence why I haven’t had the motivation to write this up (or the time!) until now. 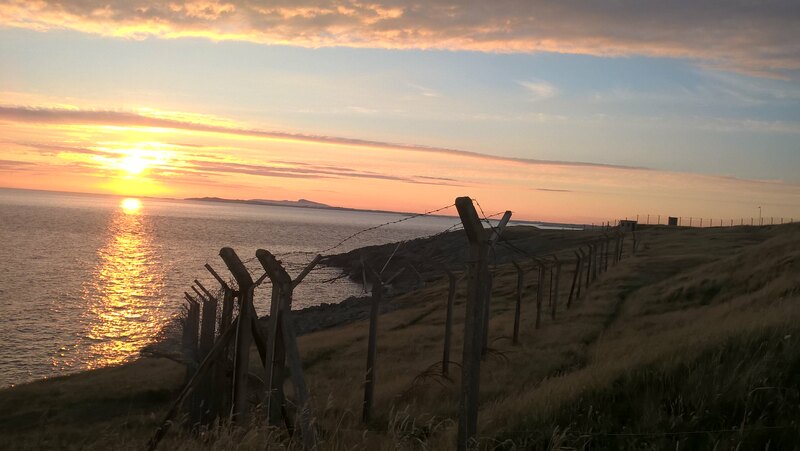 As Anglesey approaches, I’m in a slightly more positive frame of mind again. If Real Life allows me to, I’ll prep better for this one, and approach things the same as I did for Oulton. Hopefully this will be the one where I can show off the cars true potential. I’m at least going to try and enjoy it! The track was almost dry as we took the green flag lap, but all the help we’d had in the paddock was suddenly in vain, as I tried to change to 3rd gear and just got crunching noises and revs. 4th was also AWOL. Brands Hatch GP is not a 2nd gear circuit, and so rather than taking my grid space (by this time I’d managed to find reverse or 2nd gears) I dove into the pits. I managed to get 3rd gear back by desperate gear lever wiggling and selecting, and so made a pit lane start a good 30 seconds behind everyone else. The rain started as I made my charge to catch the pack, but I was going well! Alex Jones must have thought I looked comfortable in qualifying, so he stuck it in the gravel at Paddock Hill and brought the Safety Car back out. Perfect. I could make all the time back and get on the back of the chain for the restart! I caught a silver car driven by returning driver Peter Cann, who seemed to be going slowly as the rain came heavier. I pulled up inches behind him and gestured wildly for him to floor it and catch the back of the pack, but he didn’t speed up. I thought he might not know you can speed up to catch the back of the Safety Car chain, so was fuming! I got alongside him down the pit straight and pointed GO GO GO!!! but he just let me by him. I knew I couldn’t pass, so had to let him back through and tuck in behind. I’m not mad at Peter, and to be fair I could see that his car was a massive handful on every bend. He did come over to me after to apologise, and I was absolutely fine with that, as he was going as fast as he could. It was just unfortunate and very frustrating! After an eternity we got green flags and I shot past, knowing there wasn’t much hope of making up places but willing to give it my best shot! It was all going well until I suddenly couldn’t get it into 3rd gear again. I crawled around the rest of the lap making more gear changes than if I were doing the Monaco GP, before pulling into the pits to retire. I went up to the office an announced exactly what I thought I’d done – pulling alongside Peter Cann and gesturing him to catch the Safety Car – and was told I was right. Unfortunately they wanted to do it all to the letter of the law, and with no scope of understanding I was told the timing line said I’d overtaken under the safety car and I would have a 20 second time penalty applied. I pointed out the race was actually still on, at that point, but even the fact I’d retired didn’t sway them. And it would be applied to the results of that race. 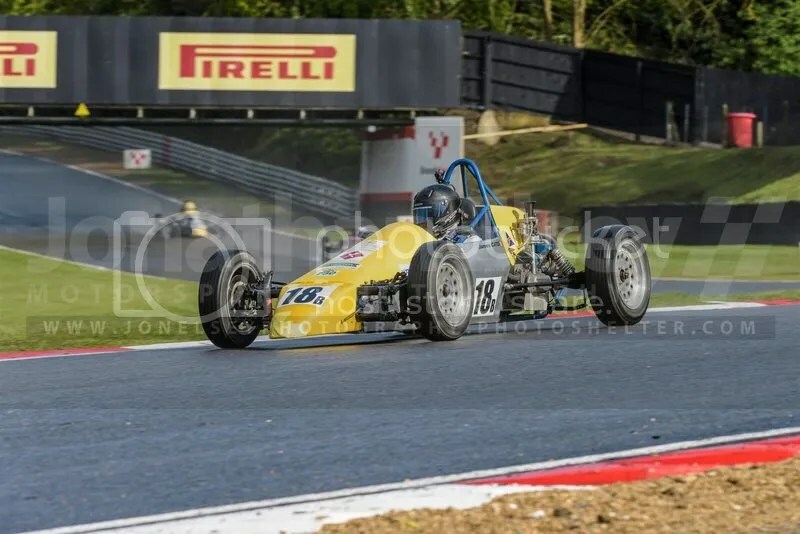 James Harridge had a bearing failure on his engine and failed to finish, and a similar time penalty applied to Craig Pollard (for just as daft reasons) meant Adam Macaulay took the win, followed by Ben Miloudi and the returning James Clennell. Jack Wilkinson won B class in 4th place overall, with Jamie Harrison and Andrew Cooper shredding my second championship place I’d had coming into the race. 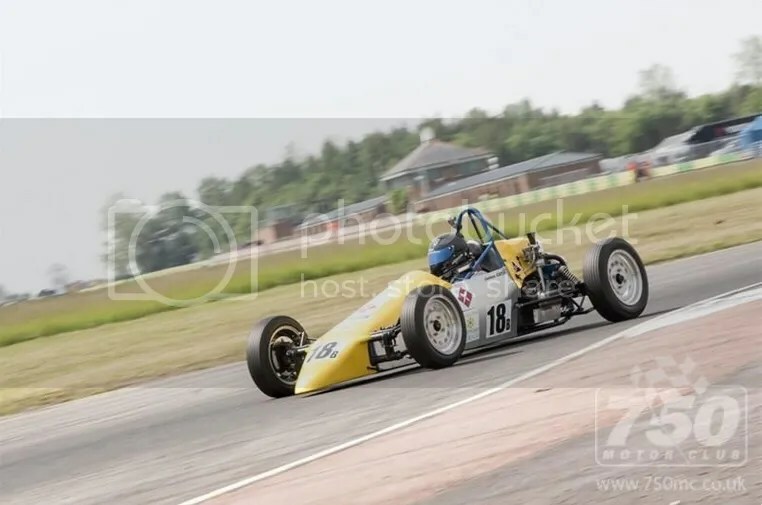 It was all a bit close to make it – but finally, on Thursday evening, Glenn fired up the Sheane and we knew we had a car to race on Saturday! Of course there was still a lot of prep work left, and that meant getting up stupidly early on Saturday morning and heading up to Cheshire for a very rushed race day. 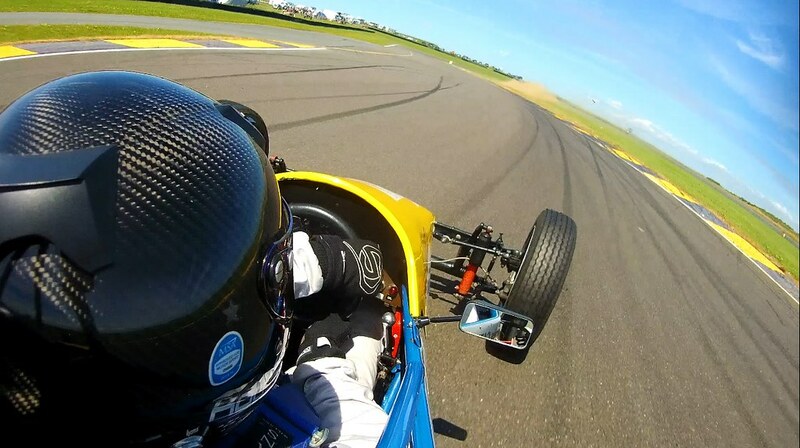 Rolling the car off the trailer, it was great to be back amongst the Formula Vee paddock. It’s a long Winter off-season, but as soon as you meet everyone again it’s as if you’ve never been away! And it was good to see some of the new drivers this season, as well as a few faces returning to Vee after a break. After the mandatory new driver briefing, scrutineering, and getting signed on, I found I wasn’t feeling very nervous about it all. We’d gone back to using the engine from early last year that we knew was good (albeit with the same internals as the other engine), so although we had confidence in having more power, we’d had no time to test anything – in fact only a few months ago I’d thought my racing was pretty much over as Glenn wouldn’t be able to work on the car or have any time for racing, due to sickness in the family. With all that in mind, we were taking the reluctant but sensible approach of using the day as more of a shakedown run. The brief was to ease the car in, get a feel for driving again after the Winter break, and above all to keep everything safe and out of trouble. If that all went ok, then I’d see if I could pick up a few places by working on getting the power down earlier – but realistically, with so many having tested at the track the day before, we would treat anything inside the top 20 as a bonus. The track was cold and damp as I rolled out of the pit lane, dropping down towards the familiar sight of Cascades. I steadily eased the throttle on from mid-corner and heard a popping sound, followed by rattles and tapping. Worse still, the car didn’t slew out of the corner sideways under power, as I’d been provoking – I’d lost all power. I couldn’t see smoke in my mirrors, and pressing the loud pedal didn’t seem to make anything worse, so I quickly eliminated the horror of a blown engine from my mind – my initial thought being I’d popped an air hose off, before I realised Vee’s don’t have any air hoses! Was it yet another snapped engine stud? If you don’t do 3 laps of a circuit then you don’t qualify to race, and you’re going home. As I cruised around the rest of the lap listening and watching the car very carefully, I figured the problem wasn’t getting any worse, and so I’d try and crawl around to get the 3 laps in, and then bring it in and hope Glenn could work his magic in time to get us out for a race. 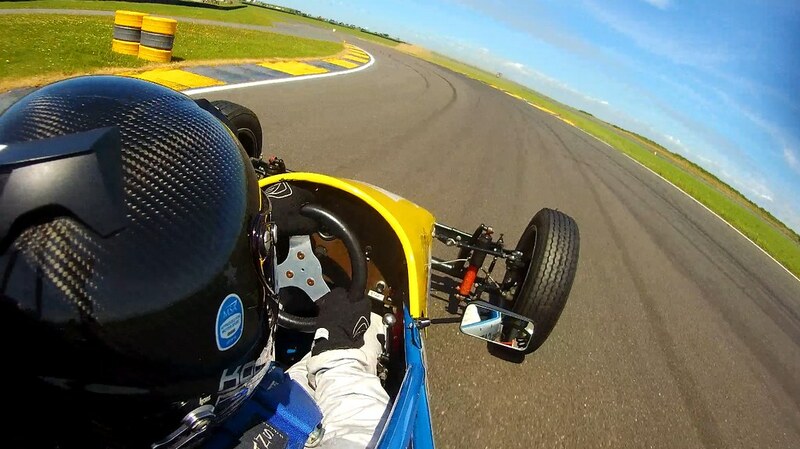 I spun once in the Hislops chicane as I tried to keep up some kind of speed as I followed the racing line – but realistically I didn’t have the power to learn anything at all from the track as I limped around on 3 cylinders trying to keep out of everyone’s way. I was locking up on the brakes everywhere, someone else had thrown oil over the track, and I had absolutely no feel for the car. If the gate at Lodge had been open I might have just drove straight out and gone home. As I drove in through the pits and back towards the garage, the revs suddenly shot up and I quickly killed the engine before it blew completely. Another problem? A quick look over the car found the left rear sparkplug had torn itself out, along with all the thread. Glenn said it was fixable at the trackside if he could find someone with the tools, but making the first race in less than 2 hours was unlikely. Disaster. As I embraced the depressing realisation, whilst seeing my name on the time sheets in 26th and 25th places for the races, Alan Harding and the AHS crew swarmed over to my car and got to work with helicoils and inserts, and before I knew it they’d done their thing and fixed the issue! It never fails to amaze me how even rivals in the Vee paddock will jump to help you in your hour of need. For how fiercely competitive AHS are, they’re always willing to help save your day at a moments notice, and I owe them a huge thanks for that! As we’d found out absolutely nothing in qualifying, we were re-setting and using this as the shakedown run, hoping everything with the car was now ok. With nothing to lose, I went for a radical set up and softened the dampers more than I ever have before, as I like it pretty stiff. The start lights went out and I rocketed off the line despite the wet, angling for a narrow gap along the pit wall, and making up 3 or 4 rows before getting blocked in and having to brake well before the first turn. Blinded by the spray, I stayed tight to the inside at Old Hall, aware of something happening to the left of me, but more concerned with finding my own way through . I believe Steve Ough and Adam Macaulay touched wheels, causing all kinds of drama as Adam spun off to the outside, and an unlucky Rickard Rainbow, who’d already taken to the grass in avoidance, was a passenger as he t-boned Adam hard. Both drivers were ok – the cars not so much so. They weren’t going to race any more today. My heart sank a little as the marshals called everyone back past me to the original grid positions, but as the race restarted I made a carbon copy start, diving past everyone again along the pit wall. I settled into a paced cruise that I normally use to feel out a new track, but seemed to still be passing people without trying. Coming down towards the Hislops chicane I hit the brakes and it was so slippery the front wheels locked instantly, and despite frantic cadence braking I couldn’t find any grip to pull the car up. I bounced straight across the grass along with a few others who’d done the same, Darren Lomas spinning off in front of me just before Knickerbrook. I carried on with what felt like a bit of a Sunday drive, still making really good progress on the treacherous track – I was loving every second! Braking into Hislops again alongside Steve Ough, and I did the same again, with Steve alongside me bouncing over the grass. We both slithered around Knickerbrook and I was able to out-drag his Dominator up Clay Hill towards Church. In fact all through the session I was having to lift off the throttle behind people when I didn’t think I could make a safe, clean pass. That second excursion had lost me a fair few places, and I assume it might be frowned upon to overshoot the same corner on 3 consecutive laps, so made sure I was braking stupidly early and gently for that one for the remaining laps. 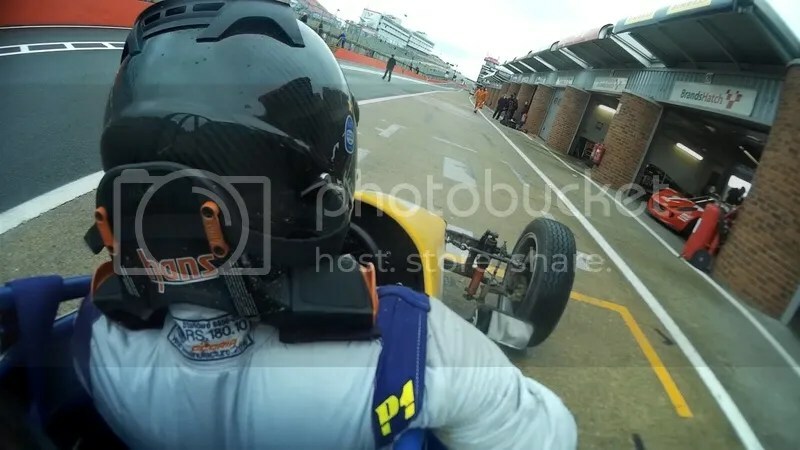 Others were still having problems as conditions worsened, however, and David Leniewski spun to the inside at Shell as I caught Jamie Harrison and a 4 way battle with them, Mark Egan and Andrew Cooper. Another mistake from Dave at Hislops let me through, as I chased down Jamie Harrison for 11th place, bearing down on him 2 seconds a lap faster on my charge, but unfortunately the chequered flag came out after only 4 laps. Jamie, me and Dave were all covered by just 4 tenths of a second at the line! I had absolutely no idea where I’d finished, but had enjoyed it all immensely. If I’d known Jamie was actually 3rd in class at the finish I’d have got more aggressive about things, but I had no idea how far up the grid I’d climbed! 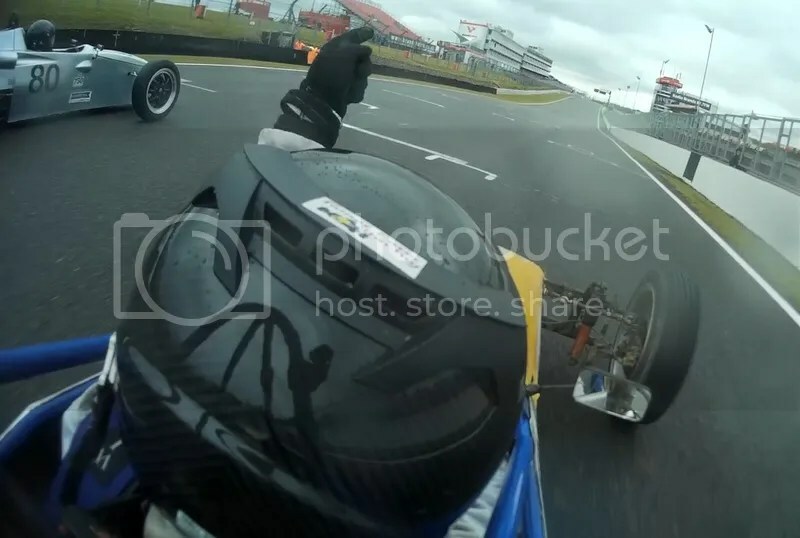 You can see on the video how much I was lifting off the throttle, still cruising, rather than stuffing it up the inside. Don’t get me wrong – I was trying to go quickly, but I was still driving more as I would in qualifying. What I’m not sure of is if I was just naturally fast there because of my bike track days, or if the more relaxed approach brought the extra speed? Thankful of my blue iridium tinted visor, I rolled into the holding area under the burning sun, on the bone dry track, only 3 hours later. So THAT’S how it’s going to be, is it? This would play directly into the hands of everyone who’d tested in the dry the day before, and I’d never been around a single corner in the dry in the Vee in my life, so for the second time that day had absolutely no idea where to brake, or how fast to take any corner on the circuit. Great. Expecting everyone to just drive away from me as I struggled to learn the track, we once more opted to just bring it home safe, and get a feel of what the car was like in the dry. Because I was so desperate for the rain, I even left tyre pressure and damper settings on the extra soft ones I’d used in the first race, still hoping the skies would open again to give me a chance. For the third time in a row I blasted off the start and again tore past half the grid against the pit wall, having to hit the brakes behind John Hartin as he fluffed a gear change and I had nowhere to get by. The problem now was that I was right in the mid pack, hammering down to Cascades, and not having an idea how fast I could go around the corner! I chose the trusty technique of giving everyone a bit of room and then just braking when they did, then concentrated on getting on the power as early as I dared. After following Hartin and returning Vee veteran Andrew Crighton around, slipping past Vaughn Jones and then Crighton just before Lodge, I got a good run and passed Hartin out of Lodge, then had a bit of a guess how fast I could get through Old Hall – straddling the curb precariously on the exit but managing to get it back on the black stuff still ahead. I kept leaning steadily on the car – not getting out of shape and yet still seeming to carry a good pace. I bore down on David Leniewski who upped his own pace in return. In hindsight we should have worked together more, but we did slow each other up a bit from there. Leniewski had the speed in the first chicane, whilst I was much faster in Island and the run up to Church. Unfortunately, sticking it up the inside in either of those places, especially as he defended, would likely have led to wheel contact and me cartwheeling off into trees and lakes. Not the thing the way to end your first few dry laps in a car that was feeling good! Despite slowing each other, we ripped into the gap to the next battle – Jamie Harrison and Neil Aldridge – and were soon swarming all over the back of them. As we came out of lodge, Leniewski had a huge run on both of them, but I had an even better one on them all. 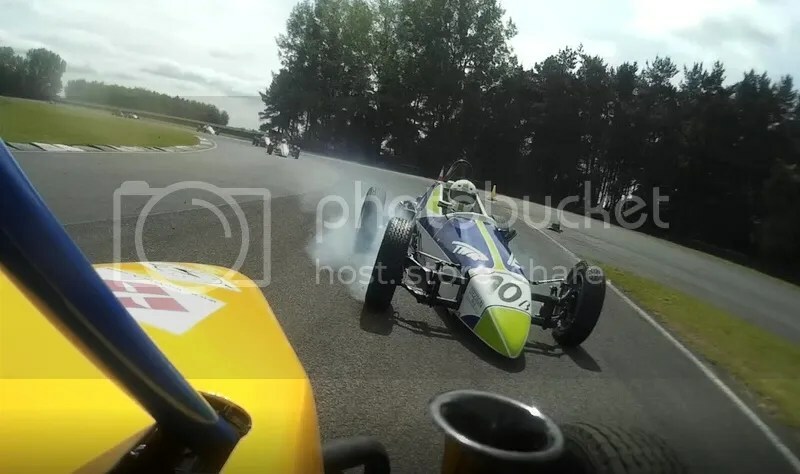 Harrison jinked right to block, and I put two wheels on the grass, aiming to pass the lot of them on the green stuff down to Lodge, before my brain kicked back in and I abandoned the overtake. Unfortunately, the chequered flag was out, and I didn’t get the chance to use my momentum… Again I had no idea where I’d finished as I came back in to the garages. I went to speak to Harrison to tell him I would have had him, and was gobsmacked when I asked where he’d come in B Class and he said he’d won! I congratulated him and then suddenly realised that I must have been 2nd! I was chuffed to bits to pick up my trophy (plus one for 6th in the Class B championship from last year), and I was actually half way home before Steve Bailey posted a Facebook message telling me I’d actually got the fastest lap in class for that race! Not only that, but I was now 2nd in the B class championship and 11th in the overall standings! I was buzzing about it for days afterwards – and what a present on my 40th birthday weekend? So we’d gone from abject despair, barely getting around a damp track, to an amazing comeback drive in torrential rain, to an even better drive on a warm dry track – all in one day! My best results ever, and on my favourite track. I was amazing to be back with the Vee crowd again, if the day was a bit rushed, and I can’t wait to get back out there on May 1st for the full GP track at Brands Hatch. Brands is my least favourite circuit, so it should give us a good idea whether my Oulton track knowledge was what made me fast, or if we’ve got as good a car this year as I think. I’ll also be announcing something else in a few days time, so watch this space!